How many of you enjoy eating beets? I know I do! Seriously, I enjoy eating them and probably prepare them once every 2 weeks for the family to enjoy. One of my favorites is Harvard Beets which my mother taught me how to make several years ago. Today we have a guest post recipe that's courtesy of The Cocoa Exchange. You'll only need a handful of ingredients to make the recipe. They look delicious and I can't wait to try them. Peel 4 medium beets and cut into ½ inch pieces. Toss with 1 tablespoon olive oil and spread on a baking sheet. Roast at 450° F, until tender, or approximately 35 minutes. 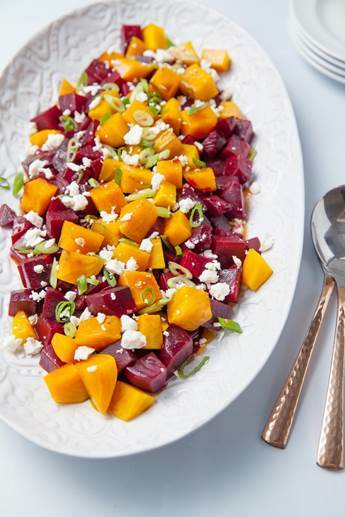 Transfer beets to a bowl and toss with Pod & Bean™ Fig Balsamic Vinaigrette and chopped scallions. Top with crumbled feta. Serve immediately. I guess you used both golden and red beets from the photograph shown. I love to use beets in different recipes because they add a delicious sweetness to the food.